Does Your Salsa Bring the Heat? Amateur chefs are invited to put their culinary creativity to the test by making their own salsa at the 2012 Salsa Challenge presented by Taxco Restaurant. 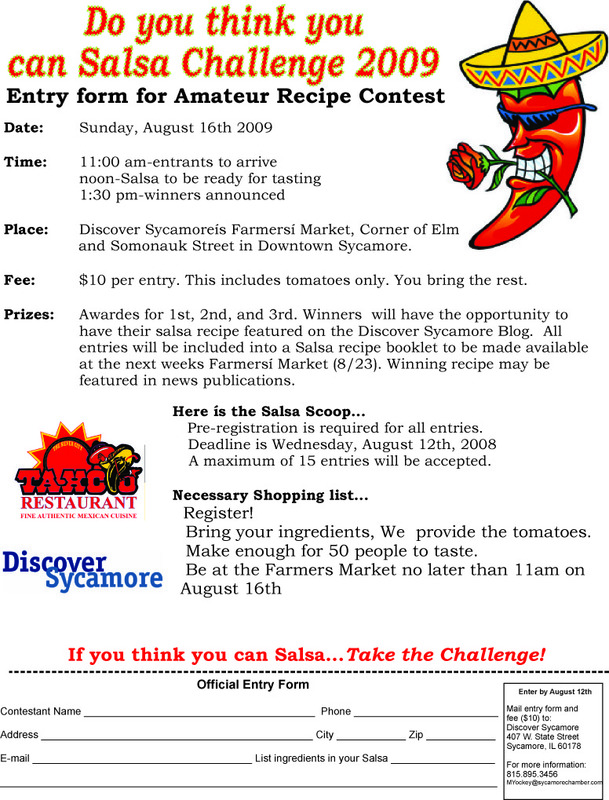 The Salsa Challenge will take place at Discover Sycamore’s Farmers’ Market on Sunday, September 9th, at the corner of Somonauk and Elm Streets in downtown Sycamore. The contest will begin at 11am, judging at noon and the winners will be announced at 1pm. Come compete head to head with other local salsa enthusiasts. 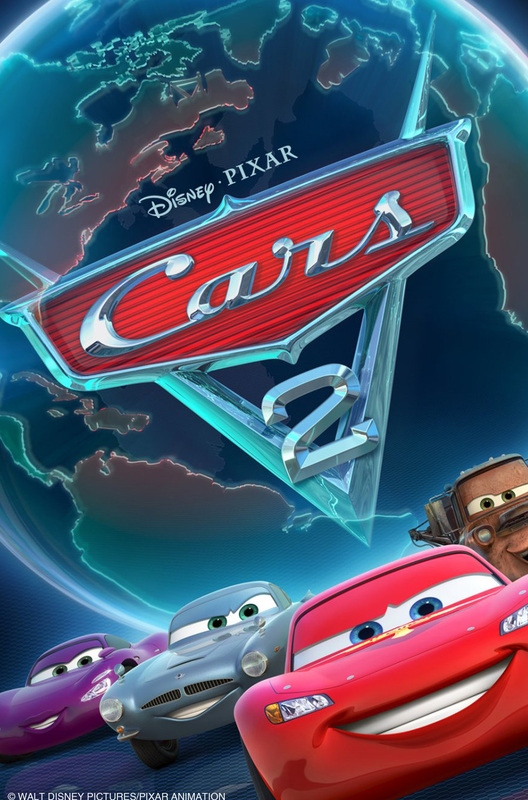 The contest is limited to 25 participants and pre-registration is recommended, as contestants are accepted on a first-come, first serve basis. The entry fee is $10 per salsa before Wednesday, September 5th. For a registration form Click Here . The entry fee for day of registration is $15 per salsa, and contestants must arrive and register before 11am. Tomatoes will be provided, but contestants must provide all other necessary ingredients and kitchen utensils. First, second and third places will be awarded prizes from Taxco Restaurant. “We encourage people to get creative and think ‘outside the box’ when submitting their recipes,” said Jesus Romero, owner of Taxco Restaurant. “The more unusual entrees will surely attract attention from the judges, “he added. The 2012 Salsa Challenge is brought to you by Taxco Restaurant and Discover Sycamore. For more information please contact Discover Sycamore at (815)895-3456 or visit discoversycamore.com. Three Fires Council, Boy Scouts of America, extends to you a cordial welcome to the 9th annual DeKalb County Tribute to Heroes on Thursday, Oct. 6, 2011, at the Kishwaukee College Conference Center-Jenkins Auditorium. Registration begins at 5 p.m., the reception with hors d’oeuvres is at 5:30 p.m. and the formal ceremony begins at 6:30 p.m.
Congratulations to the 2011 Tribute to Heroes honorees, Bruce Griffith of Sycamore, Barbara “Boots” Hoffman of Sandwich, Elmer Hughes of Genoa, and Jesus Romero of Sycamore. The Tribute to Heroes program recognizes members of the DeKalb County communities who have unselfishly dedicated themselves to community service and to the welfare and development of its youth. Leadership, citizenship, and helping others are important qualities that the Boy Scouts of America instill in its youth and looks for in adult leaders. The honorees provide excellent examples of not only these qualities but also community responsibility and personal integrity, best typifying the objectives of Scouting. Opportunities for sponsorship of Tribute to Heroes are: Distinguished Eagle Sponsor—reserved for Daily Chronicle; Eagle Sponsor—highest level of sponsorship for contributions of over $2,500; Sponsor Table for $2,500—receives a recognition plaque, membership and recognition in Scouting’s Guardian Fellowship, recognition throughout program, admission for ten; Guardian Table for $1,500—receives membership and recognition in Scouting’s Guardian Fellowship, recognition throughout program, admission for ten; Heroes Table for $750—receives recognition throughout program, admission for ten; and Individual Sponsorship for $75—receives recognition throughout program. Tickets are available for $50 each at the Daily Chronicle office, DeKalb, at the main branch of Castle Bank, DeKalb, and both the Sycamore and Genoa branches of The National Bank and Trust. For more information, please call Zachary Knoch, Three Fires Council, at 630.584.9250. Community member Becky Hepker recommended Bruce Griffith as an honoree, and in response, Bruce is honored for his community involvement, commitment to supporting our youth, and his relentless desire to help others excel in their own personal improvement. Bruce said, “Every day is special, a memory of past success, and a thought toward future development.” Mention any high profile community member, and Bruce will be his friend. As a young man, Bruce was a Cub and Boy Scout in Sycamore, later moving to the country and focusing on 4-H activities. He graduated from Illinois State University and started teaching in 1971 at Brainerd, MN. A year later he came back to Sycamore to help his father with the family business for an expected three years. But, it led to a 30-year career running Punk’s LTD. Along the way, he built relationships that he terms “friendships” with peers, likely more than any Sycamore resident. In 2001, he sold the business, one day later becoming an employee of the Kishwaukee Education Consortium (KEC), where he currently holds the role of Special Projects Coordinator. In 2008, along with two partners, he established the R.W. Griffith Group, dba Punk’s, at the same location in Sycamore as his father’s business. Kishwaukee Education Consortium holds Bruce’s true calling…helping develop hundreds of young people in DeKalb, Sycamore, Rochelle, Genoa-Kingston and Hiawatha schools. Seldom does a day go by that fits his motto, “every day is special,” as his students are everywhere in our communities in 17 different KEC related programs. As he put it, “I walk into the Sycamore Fire Station and see as many as eight former KEC students from the fire science program working there.” Being an established pilot, he was instrumental in developing the Aviation Program at KEC, one of very few of this type program in the entire country. Winner of the 2011 Clifford Danielson Award from the Sycamore Chamber of Commerce, Bruce has served on the board of the Farmers & Merchants Bank, has provided flight services to friends needing to meet appointments at places as far away as the Mayo Clinic in Rochester, MN, works regularly with the cities of Sycamore and DeKalb, and serves on several advisory committees at Kishwaukee College. Having a friendship with Bruce means he is part of your activity. He follows up on former students, enjoys continuing his support long after they graduate, while still finding time for his wife Diane, and daughters, Kristin and Kara. In addition, he enjoys his passion for flying airplanes. He exemplifies the sign entering Sycamore…Life offers more in Sycamore. The daughter of Clara Rhoads and the late Herman Rhoads, Mrs. Barbara “Boots” Hoffman, was born in a farmhouse in West Brooklyn, Illinois, and she and her family moved to Sandwich in the fall of 1941. Boots began her distinguished career at the Sandwich Community Hospital (then known as the Horatio N. Woodward Memorial Hospital) while still in high school, working in the kitchen and later as a nurses aid. After graduating from high school in 1953, she received her basic nursing training and R.N. at Copley Memorial Hospital in Aurora. In 1956 Boots married her high school sweetheart, Don Hoffman, and they had three sons, Reed, Phillip, and Lynn. Boots was a den mother while her young sons were in the Scouting program. Also in 1956, she returned to Woodward Memorial Hospital where she has held positions in nursing, including staff, charge and supervisor. Boots served as Director of Nursing In-service from 1972 to 1984, and in 1976 she served as the interim Director of Nursing for six months. In 1984, Boots was named Director of Community Health Education. She was also Discharge Planning Coordinator, a member of the Illinois Nurses Association and the Sandwich Hospital Auxiliary where she served for over 28 years as chairman of the Health Career and Scholarship Committee. Boots has been involved with the American Lung Association since 1984. Elected to the Board of the Lung Association, she served as a delegate for the American Lung Association of Illinois in 1987. Through the American Cancer Association, she coordinated the Sandwich Area Weigh-A-Thon, an event that raises funds from dollar pledges towards an individual’s weight loss. For every pound lost, one dollar went to the American Cancer Association. 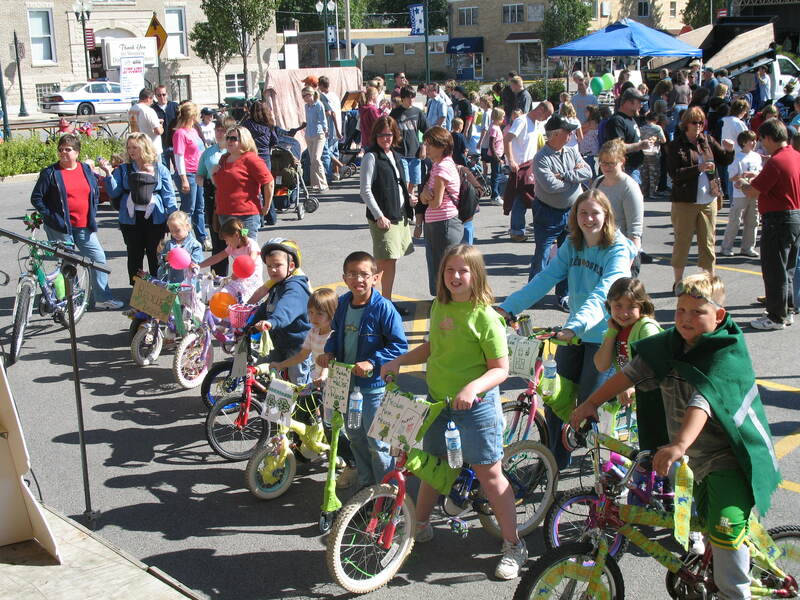 Boots also helped coordinate the Sandwich area’s Great American Smoke-Out, when smokers give up smoking for one day. Boots was the Coordinator of Emergency Medical Services for the Sandwich Fair Association, coordinating the emergency medical services at the fairgrounds throughout the year, and she has also been a member of the advisory board for the health occupations class at the Indian Valley Vocational Center since the center opened. For many years, Boots judged the Freedom Day parade and also the baby contest. Boots was honored as Grand Marshal of Sandwich Freedom Days in 1989, known that year as “Saluting Our Community Volunteers,” Boots was the obvious choice to be Grand Marshal. In addition, Boots, a past board member of the DeKalb County Family Services, has helped coordinate the Big Brothers/Big Sisters Bowl for Kids’ Sake. In retirement, Boots has become a student of local history, collecting local history books, collecting Sandwich memorabilia, especially post cards and photos of old Sandwich, and researching genealogy for others. She has served on the Sandwich Sesquicentennial planning committee and helped with a photo history book entitled, Images of America: Sandwich. Boots, of course, is a long-time member of the hospital auxiliary and served on the KishHealth Foundation Board from 1999 to 2007. Boots currently serves on the DeKalb County Nursing Home Foundation Board and is a long-time volunteer for the Sandwich Opera House. She is also a member of the Sandwich Historical Society and of the Plano American Legion Auxiliary. Boots continues to keep in touch with classmates from high school and nursing school by helping plan reunions. Barbara “Boots” Hoffman exemplifies community volunteerism and retirement is not slowing her down. Elmer T. Hughes, the son of Ray F. and Jewel Hughes, was born in Bevier, Missouri, the youngest of three siblings. In 1932, due to a job transfer from American Brass, his father moved the family from Kenosha, Wisconsin, to Sycamore, Illinois. Elmer attended Sycamore schools and while still in high school he began working at Anaconda Wire and Cable where he worked for 39 years. After Andaconda closed, Elmer spent five years working at Falls Products. Elmer then worked for another 19 years at Tobinson’s Ace Hardware, until his retirement in July 2010. Elmer met the love of his life, Jeannette (Jean) Wager, and they married in 1952. They have a daughter; Patricia (Brian) Clauss, three grandchildren; Natalie, Nathan, Clint, and four great grandchildren; Christopher, Ian, Nolin and Levi. Elmer followed in his father-in-law’s footsteps and joined the Genoa-Kingston Fire Department in 1955. He retired as chief in 1988 and was appointed as a Trustee by the County Board in 1997 and is still active as a Trustee of the Genoa-Kingston Fire Protection District. Being a volunteer firefighter includes many different responsibilities. Elmer has fought fires in the middle of the night, provided comfort for victims in need, devoted himself for years to the success of the annual Genoa Days Event and, as fire chief, utilized his leadership skills to direct the entire Genoa-Kingston Fire Department. For over 56 years, Elmer has continued to show his commitment to fire service and his community. In 1955, he joined the Genoa Lions Club. He has worked on all of its countless service projects to the community. Elmer is still an active member of this international service organization. He was also a member of the DeKalb County Auxiliary Police. When his daughter was in middle school, the family enjoyed attending Genoa-Kingston sports games. Elmer’s wife, Jean, began tracking statistics for basketball games and when a position became available, Jean volunteered to be the official scorekeeper. Elmer followed his wife shortly thereafter and volunteered to become the official timekeeper. During his time, they did all boys’ home and away basketball games and when the need arose for a girls’ scorekeeper, Elmer volunteered to cover those too. They held these roles for over 35 years and as a result, were inducted into the Illinois Basketball Coaches Association (IBCA) Hall of Fame. Elmer’s timekeeping led to his awareness that the high school was in need of a parents’ organization to support athletics. In September of 1966, he became a charter member of the Genoa-Kingston Boosters Club and hosted the first meeting between coaches and other interested parents in his living room. The Genoa-Kingston Boosters are still a very active organization. In 1987, while Elmer was working in Genoa for Falls Products, an armed robbery in progress at Citizen’s First National Bank was “toned out” over his fire pager. Elmer switched his radio to the police department scanner and realized there was only one officer on duty. Elmer left his job and went to help chase down the suspect. When he caught up to the suspect and the lone police officer, the suspect was on the ground but the officer needed Elmer’s help. Elmer notified the Genoa dispatch and also, while the officer held the suspect down, Elmer handcuffed him. Elmer assisted with the transfer of custody to the county police and went right back to work as if it was just another ordinary day. Jesus Romero was born in Cuernavaca, Morelos, Mexico and came to the United States in 1986. In 1992, he moved to Sycamore and made it his home. He met Stephanie Hazelton and fell in love. They have been married for 17 wonderful years and have two great children; Madison, age 16, and Wyatt, age 10. Both of the children have been involved in Scouting. Growing up in Mexico, Jesus did not have the opportunity to become a Boy Scout because there were no Scouting organizations nearby that were affordable to his family. Jesus went to work for his uncle at Taxco Restaurant #2 (now Taxco Restaurant Too) in 1992 and worked for him for 10 years. 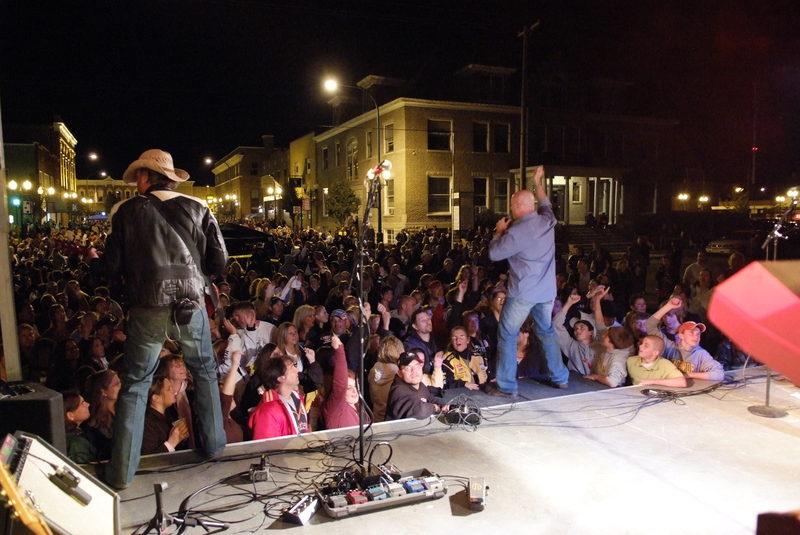 Jesus and his uncle organized and hosted the first Sycamore Cinco de Mayo event in 1997, of which the proceeds went to the Relay for Life, American Cancer Society. In 2002, Jesus bought the restaurant from his uncle and runs it very successfully today. Jesus believes in giving back to the community that has offered him great opportunities. In addition to the Sycamore Cinco de Mayo celebration, Jesus is a past member, treasurer, and vice president for the Sycamore Jaycees. He also served on the Board of Directors for the Family Service Agency and is also a past board member, treasurer, vice president, and president of Conexion Comunidad. The purpose of Conexion Comunidad is to provide connection for services to the Latino community by offering information, education, resources and services. At the same time, Conexion Comunidad promotes Latino heritage to the non-Latino community by working with and coordinating services through existing agencies, acting as a bridge between the communities. Jesus also served on the board of the DeKalb County Community Foundation. In an advisory capacity, Jesus was involved with the Community Works committee with the DeKalb County Community Foundation, was on the advisory committee for Big Brothers/Big Sisters, and was also on the Adult Education Advisory Committee for Kishwaukee College. Currently, in addition to running a restaurant, which keeps Jesus busy, he is vice president and member of the Board of Directors for the DeKalb County Health Department, member of the Board of Directors for Discover Sycamore, and is a member of the Kiwanis Club of Sycamore. Jesus is also on the Human Relations Commission for the City of Sycamore, is on the Architectural Review Committee for the City of Sycamore, and is also a committee member for the 50 Men Who Cook fundraiser. Always willing to help the community, Jesus often donates his wonderful cuisine to some of the local fundraisers, such as: 50 Men Who Cook; Sycamore Chamber/ Discover Sycamore Events; Farmers’ Market; Summer on State; Cruise Night; Block Party; the Pumpkin Run; VAC’s Meals for Moms; American Red Cross Dining Red; and the Sycamore Sports Boosters’ For the Love of the Game. Who Makes the Best Salsa in Town? Does your salsa bring the heat? 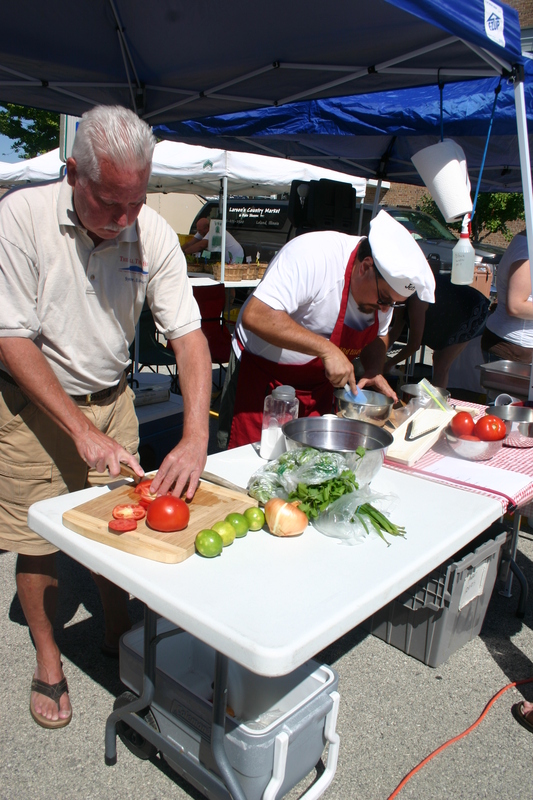 Amateur salsa chefs are invited to put their spicy concoctions to the test by participating in the 2011 Salsa Challenge presented by Taxco Restaurant on Sunday, August 21st at Discover Sycamore’s Farmers’ Market in downtown Sycamore. The contest will begin at 11am, judging at noon and the winners will be announced at 1pm. Come compete head to head with other local salsa enthusiasts. The contest is limited to 25 participants and pre-registration is recommended, as contestants are accepted on a first-come, first serve basis. The entry fee is $10 per salsa before Wednesday August 17th. 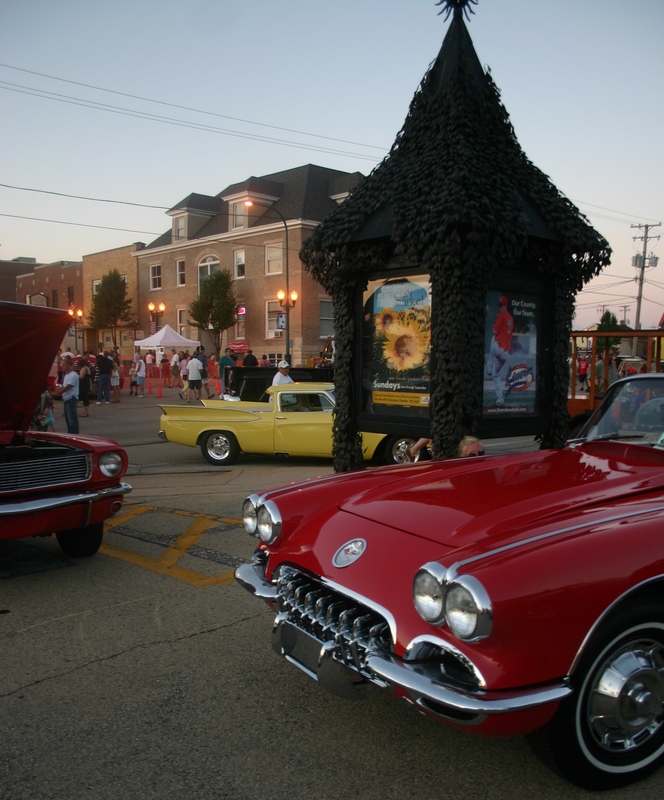 A registration form can be downloaded Click Here or picked up at the Sycamore Chamber of Commerce office. The entry fee for day of registration is $15 per salsa, and contestants must arrive and register before 11am. Tomatoes will be provided, but contestants must provide all other necessary ingredients and kitchen utensils. First, second and third places will be awarded prizes from Taxco Restaurant. If you’re not the next ‘Iron Chef of America’, there’s no need to worry; as long as you have an appetite for an array of homemade salsas. 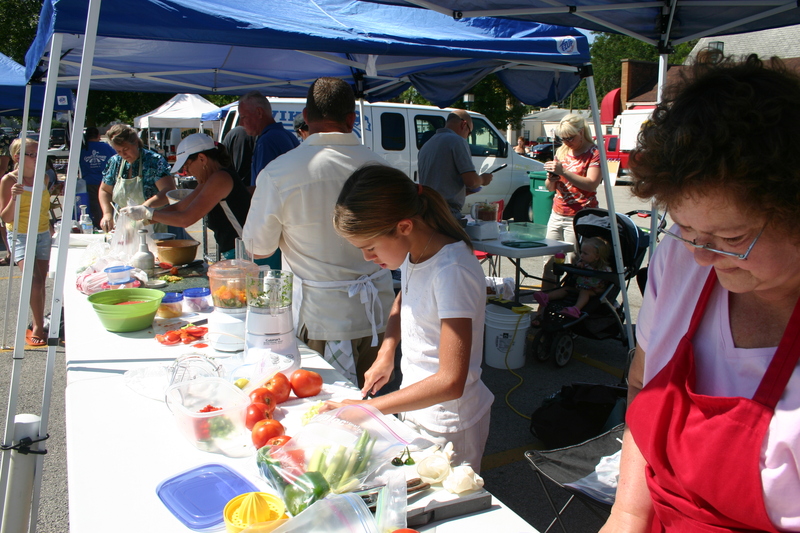 Enjoy a sunny, Sunday afternoon by strolling through Sycamore’s Farmers’ Market while listening to live music with chips ready to scoop and mouths ready to taste! The 2011 Salsa Challenge is brought to you by Taxco Mexican Restaurant. 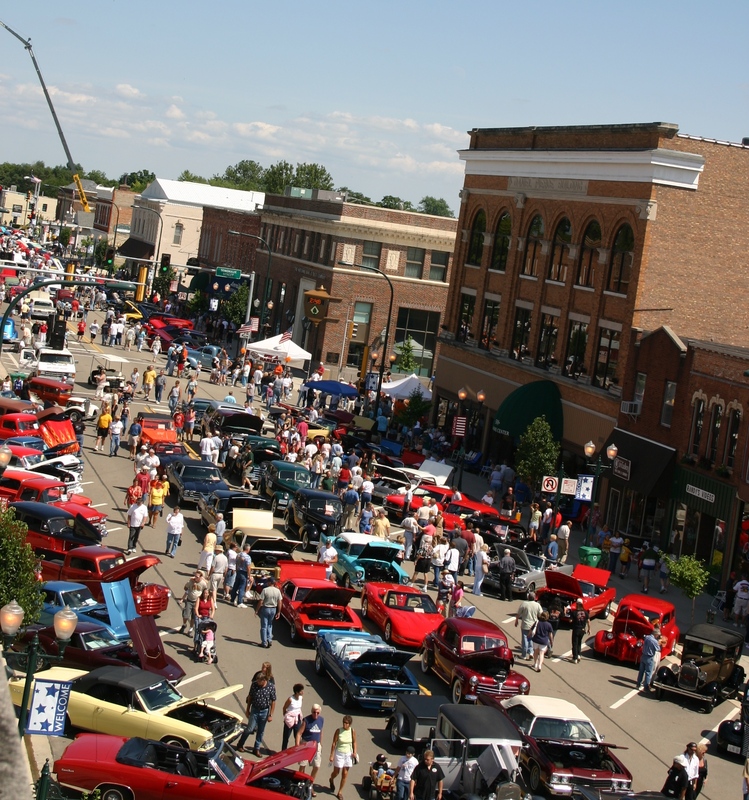 For more information please contact the Sycamore Chamber of Commerce at (815)895-3456. The 2011 Salsa Challenge is ready for you! Does your salsa have what it takes to earn top honors? : Pictured from left to right: Jesus Romero, Cinco de Mayo founder and Taxco Restaurant owner; Shelly Johnson, Community Cares Clinic director; Chris Sarver, KishHealth Foundation development assistant; Dawn Roznowski, NIU College of Health and Human Sciences assistant to the dean for Finance and Clinic Operations; and David Wester, PA-C, Community Cares Clinic clinical manager. Community Cares Clinic received a $4,500 donation from proceeds from the 14th Annual Cinco de Mayo Festival held May 1, downtown Sycamore. The Cinco de Mayo Festival featured entertainment for the whole family including authentic Mexican food, live music and entertainment, games, a petting zoo, pony rides, face painting, and much more. The Cinco de Mayo funds donated will be used for patient care at the Community Cares Clinic. These funds will help subsidize unmet medical costs for roughly 400 patient visits for those without insurance. “Community partners like Jesus allow Community Cares Clinic to bring change in our community and access to healthcare when they would otherwise have none. We are incredibly grateful for this,” said David Wester, physician assistant-certified, Community Care Clinic Clinical Manager. “Thank you Jesus and all of the volunteers who helped with the Cinco de Mayo festival, for this wonderful gift. These funds will help many people in need of healthcare in our community,” said Renee Ellingson, KishHealth Foundation executive director. 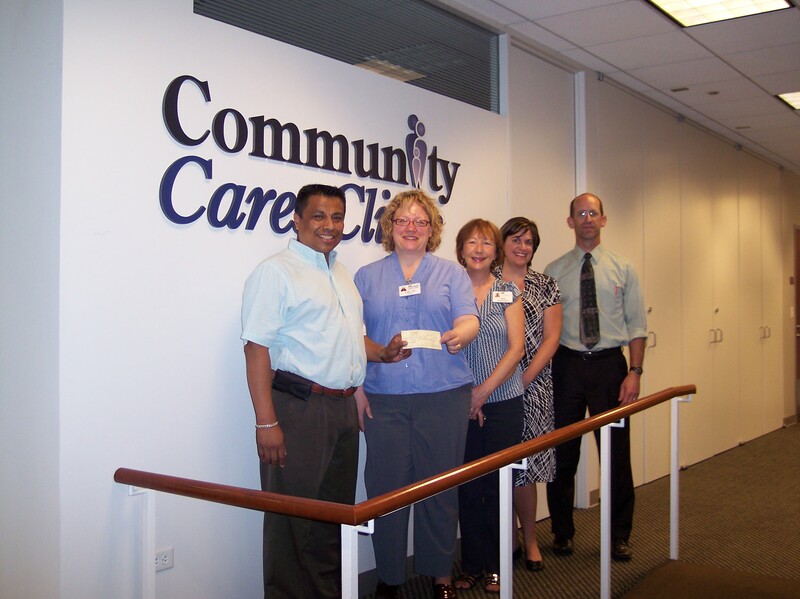 Community Cares Clinic is a collaboration among KishHealth System, Northern Illinois University, and private donors to provide individuals and families affordable access to primary medical care. The goal of the clinic is to allow patients to establish ongoing relationships with medical providers to meet their healthcare needs. For more information about Community Cares Clinic please call 815.752.3253 or visit the website at www.kishhealth.org/Community-Cares-Clinic. If you would like to make a donation to Community Cares Clinic and help those in need of affordable access to healthcare please contact KishHealth Foundation at 815.748.9954 or www.kishhealthfoundation.org. Think you can salsa? Take the challenge!